Don’t you think it’s about time we get down to the real thing?….We’ve roasted vegetables, cut up pumpkin, and peeled apples. Now let’s eat some mac and cheese. Here we are into November and we have every right to put apples in our pancakes, chicken in our pot pies, and chili beef in our Mac and Cheese. We have every right to all the comfort foods we can possibly eat. Routines are comforting don’t you think? I have my routines. I get my oil changed every 3000 miles, I get my hair cut every 6 weeks, I drag myself out of bed every morning and back into it every night somewhere between 11 and 12m. It all feels good, and right. In the catalog of sometimes mundane routines is this Mac and Cheese recipe. About three times a year I over-indulge and make this dish and wonder why I don’t make it a part of my more pressing monthly routine. Then I remember the calories, making the roux, assembling it all and baking it. Its worth it though, but still it remains my every-once-in-a-while dish. Maybe that’s why I enjoy it so much when I do make it. Something about absence making the heart grow fonder? 1. Bring a pot of salted water to a boil. Add the pasta and cook as the package directs. Reserve 3/4 cup of the cooking water, then drain the pasta. 2. Meanwhile, melt 1 Tbsp. butter in a large nonstick skillet over medium heat. Add the onion and cook, stirring, until soft, about 5 minutes. Add the tomato paste and chili powder and stir until brick red, about 2 minutes. Add the beef and cook, stirring, until browned, 4 minutes. Stir in 1/2 teaspoon salt. Spread the mixture in a 3-quart baking dish. Preheat the oven. 3. Having cooked the beef, now we make a roux. Melt the remaining 2 tablespoons butter in the same skillet over medium heat. Add the flour and cook, stirring, 1 minute. (It’s a thick and goopy mess. You’re totally doing it right.) Slowly add the milk and reserved cooking water. Bring to a simmer and cook, whisking away until thick, about 2 minutes. Add 2 cups cheese, the cooked pasta and 3/4 teaspoon salt and stir until the cheese melts. Stir in the cheese and let it melt. All that cheesy sauce gets inside the shells…Oh, Wow! Spread over the beef mixture. This is all about layering flavors. 4. Mix the remaining 1/2 cup cheese and the breadcrumbs; sprinkle over the pasta mixture and bake for about 20 minutes. Top with remaining cheese and crumbs and bake for 20 minutes. Before removing from the oven, turn on the broiler, and broil until the top is golden and crunchy. Top with the scallions and serve. Oh man… this is really good! Roasted chicken thighs with fennel and onions. Weekend suppers usually revolve around an oven baked dish in my household, especially during the cold weather months. We love chicken in all its many forms and (dis)guises. Roasting a whole chicken is great when you have a lot of time, but sometimes you would like roast chicken without spending the time. I’m not talking about rotisserie chicken here, although that’s always good, too. You can get the end result of roast chicken by using smaller pieces that cook so much faster. For a weekend meal I prepared a chicken dish that I haven’t made in quite a long while: bone-in chicken with a herb-garlic mixture rubbed under the skin, on a bed of fennel, and onions. Here is my 45-minute version. Cutting up the fennel and onion. 2. Combine 1 teaspoon olive oil, garlic, 1 teaspoon thyme, 1/4 teaspoon salt, and 1/4 teaspoon pepper in a small bowl. Loosen skin on thighs by inserting fingers, gently pushing between skin and meat. Rub garlic mixture under loosened skin. Make a paste with oil and herbs. Rub under skin of thighs. 3. Heat a large ovenproof skillet oer medium-high heat. Add 1 teaspoon oil; swirl to coat. Add chicken thighs to pan, skin side down; cook 4 minutes. Turn thighs over and brown other side. Remove from pan and set aside, reserving any pan drippings. Brown the thighs and set aside. 4. Into the drippings in the skillet, add the fennel and onions. Over medium heat, toss to coat and brown them a little. Pour in chicken broth. Remove skillet from heat. Lightly brown the fennel and onions. 5. Place chicken thighs on top of vegetables and place skillet in the hot oven. Bake for 40-45 minutes until chicken juices are clear and vegetables are tender. Gnocchi with Bacon and Tomatoes. With this recipe I would like to introduce you to gnocchi- light and tender potato dumplings-a Northern Italian classic. They can be made “from scratch” at home or purchased in a shrink wrapped package from the super market especially one with a large Italian imported foods department. Those are the ones that I use most of the time, as making them myself can be somewhat time consuming. Prepackaged gnocchi from the supermarket. Gnocchi can be used in a variety of ways. The simplest is to cook them and serve with melted butter and grated Parmesan cheese on them. Another way would be to serve with any type of spaghetti sauce that you would normally use with pasta. This recipe features the gnocchi with crisp bacon, fresh tomatoes, and lots of freshly grated Parmesan cheese. Served with a side salad, this makes a very filling and satisfying meal. 1. In a large skillet, cook the 5 slices of bacon over medium-high heat until crisp. Drain on paper towels; pour out all but 2 teaspoons fat from the skillet. Bacon crisped, tomatoes, onions and garlic chopped and pan ready. 2. Meanwhile bring a pot of water to boil and cook the gnocchi as package directs. Drain and keep warm. 3. To the fat remaining in the skillet, add the onions and garlic. Sautee lightly just to soften. Add tomatoes, basil and red pepper flakes; season with coarse salt and ground pepper. Cook until tomatoes begin to break down and sauce is chunky, about 6 minutes. Saute onions and garlic, then add tomatoes. 4. Add the cooked gnocchi and the bacon broken into pieces. Once gnocchi are cooked, add to sauce with bacon. Toss until gnocchi are heated through and coated with sauce. Sprinkle with chopped fresh parsley and shaved Parmesan and serve immediately. Sprinkle with parsley and grated Parmesan cheese before serving. This morning I found a package of boneless pork chops in the freezer that had been in there for a while and needed to be used. The usual question arose—how shall I cook them? Boneless chops can be quite dry since they have little or no fat on them, so I wanted something that would make a sauce or gravy for moisture. In looking through my file of “pork recipes” I came across this one that called for using pork tenderloin that by serving time would be sliced anyway, so why not substitute the chops instead? So—that’s what I did. As I hoped, this dish turned out to be very flavorful with thyme as the seasoning of choice, and moist with its sauce made of chicken broth and heavy cream. YUM! The potatoes and vegetable get cooked along with the pork making this almost a one-pot meal. I sautéed some sliced apples in butter to serve with it. An added bonus is that one serving equals 482 calories. Not bad! It tastes richer than that. Pork chops, fennel and red-skin potatoes, a good blending of flavors. 1. Preheat oven to 425*F. Halve the pork tenderloin crosswise; sprinkle with 1 tsp. thyme (1/2 tsp. dry thyme) and 1/2 tsp. each salt and pepper. Heat 1 Tbsp. olive oil in a large nonstick skillet over medium-high heat. Add the pork and cook, turning, until browned all over, about 5 minutes. Transfer to a roasting pan, roast until a meat thermometer inserted into the thickest part of the pork registers 140*, 12 – 15 minutes. I cooked the chops for 12 minutes. 2. Meanwhile, heat the remaining 1 Tbsp. olive oil in a large saucepan over medium heat. Add the fennel, garlic, potatoes, wine and 1 cup water; season with salt and pepper. Stir, then cover and cook, stirring occasionally, until the potatoes are almost tender, 15 minutes. Add fennel and potatoes to the skillet. 3. Uncover and cook until the potatoes are tender, about 10 minutes. Add the broth and the remaining 1/2 tsp. thyme (1/4 tsp. dried thyme). Simmer until slightly reduced, 1 minute. Add the cream; increase the heat and gently boil until slightly thickened, about 1 more minute. Add in the heavy cream and cook to thicken a bit. Season with salt and pepper. Slice the pork and serve with the vegetables and sauce. Top with chopped parsley. Served with sautéed apples, a wonderful week night meal. A one-dish meal that is easy and quick to prepare using a short cut: Rotisserie Chicken. I see absolutely nothing wrong with making my life a little easier at times by picking up a rotisserie chicken at the super market and building a meal around it. After the first meal, I usually use what’s left for chicken salad sandwiches. What brought me to making this dish was Mr. D’s request for Chicken Fettuccine Alfredo. What better time than now when I had a bunch of broccoli on hand and the remains of the rotisserie chicken. I just combined all that and what resulted was this dish that was very close to what he asked for. This is how it went together…..
1. Cook fettuccine according to package directions adding broccoli during last 3 minutes of cooking time. Drain. Set aside. Place cooked fettuccine and broccoli in a serving dish. 2. Meanwhile, melt butter in medium saucepan over medium heat. Add minced garlic and sauté briefly. Add milk or half and half, and pepper. 3. Simmer, uncovered, for 10 – 12 mintes or until thick, stirring frequently. When sauce has reached desired consistency, stir in Parmesan cheese. Pour on Alfredo sauce and chicken. Mix together. Transfer to serving dish and serve with additional Parmesan to grate on at the table. After having made this recipe I would make these changes next time around: add 2 Tablespoons flour to the melted butter before adding the milk to help the sauce thicken up more; add some shredded Asiago to the Parmesan for a stronger cheese flavor. You could also use heavy cream in place of milk for a much richer sauce. This is definitely a fantastic meal, one that reheats well in the microwave the next day. Italian Sausage, Oreccietti, and Broccoli Rabe. Last week was crazy busy. All of a sudden it seems everything cranked up leaving me wishing for the quiet days of a month ago when all I had to do was sit outside and read, sip iced tea, and dream of meal plans and menus. Well, it was almost like that! Anyway, I feel like I’m in over my head with a mother-in-law just in the hospital for surgery, trying to keep Dad well fed, two birthdays, back to back, each requiring a cake, and a husband out several evenings a week and needing an early dinner. Plus keeping up with my dance lessons and classes. Whew! I’m not handling this with the ease and grace you’ve come to expect of me. Quit laughing. I mean it. I can be graceful sometimes. OK, fine. I’m handling it with a glass of wine in my hand and complaining loudly. But once in a while I do plan ahead, and this dish is one of my fall-back-on meals for such times. It makes a fairly large quantity, enough to freeze a portion for another time, or enough to share, which is what I did, so I could send a nourishing meal to Dad. It doesn’t take very long to make, and you know you’re eating a filling and healthy meal. It also reheats well in the microwave, for when people are coming and going and need to eat at different times. All the ingredients getting cozy together make a great meal. 1. Bring a large pot of lightly salted water to a boil over high heat. Add the pasta, and cook until al dente, 8 to 10 minutes; drain. 2. Meanwhile, heat the olive oil in a large skillet over medium-high heat. Stir in the Italian sausage until crumbly and no longer pink, about 5 minutes. Sausage crumbled and brown, add in minced garlic. 3. Stir in the garlic, and continue cooking until the sausage begins to brown, about 5 minutes more. Pour off the excess grease, then pour in the chicken broth and red pepper flakes. Chicken broth added–no pepper flakes for us. Bring to a boil over high heat, then add the broccoli rabe, and cover. Cook until the broccoli rabe is tender, about 4 minutes. 4. When the broccoli rabe is done, stir in the butter, Parmesan cheese, salt and pepper until the meat sauce has thickened. Toss with the pasta and serve with more cheese to grate at the table. The light broth, butter and cheese sauce makes a nice change. Served with tomato salad. Pretty plate! Baked, stuffed jumbo pasta shells. This one-dish meatless meal has always been considered a comfort food in my mind, and one that I’m more likely to make during the colder months of the year. However, I had all the right ingredients, but in small quantities, so I put together a smaller-sized version, while I was cooking on the weekend, refrigerated it, and had it ready to pull out and stick in the oven on a weeknight when I knew I would be having a busy day. The ingredients for the filling are some of the same ones as for the stuffed portabellos, therefore I had open containers that needed to be used up. This meal takes me back to my years living at home when my mother made it often with her homemade marinara sauce. That’s usually what I do also, but as I said this is my “quickie” version. I don’t think that I would have included it here on the blog except for Mr. D’s urging. My thoughts are that most people must know how to make stuffed shells, but Mr. D. thinks otherwise. He says it is excellent and I should share it, so here is how it all goes together. 1. Prepare pasta as directed on the package. Undercooked a little so they keep their shape is good. Drain. Rinse with cold water. Drain and arrange on a kitchen towel in a single layer ready to fill. 2. Meanwhile mix together the ricotta, 1/2 cup mozzarella cheese, and the Parmesan cheese. Add egg, spinach and seasonings and mix to blend well. Ricotta cheese, spinach, egg, cheese and seasonings. 3. 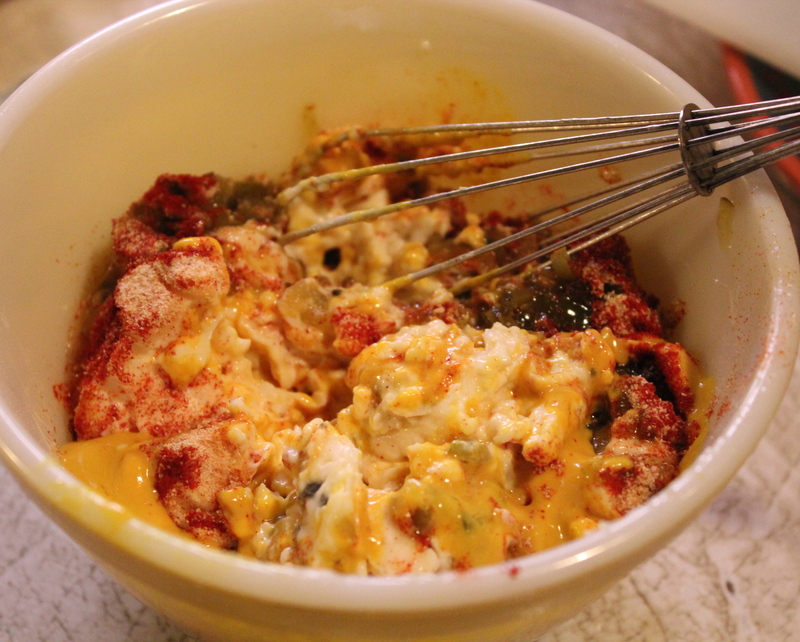 Using a smallish spoon, fill the shells with the cheese mixture. 4. Lightly spray a square baking dish ( 9″ square) with baking spray. Spoon sauce into the bottom of the dish, enough to cover the bottom in an even layer. Arrange the shells in a single layer on the sauce. Arrange filled shells on a layer of sauce. 5. At this point, if you will be baking the casserole at a later time, cover tightly with plastic wrap and refrigerate until you plan to bake it. If baking now, continue by pouring 1 – 1 1/2 cups more sauce over the shells and bake at 350*F for 30 minutes or until hot. Sprinkle with additional mozzarella cheese. Turn off the oven and allow the dish to remain in the warm oven to melt the cheese. Hot and melty, just out of the oven. 6. To bake at a later time: remove the casserole from the fridge about 1 hour ahead to bring to room temperature. Preheat the oven and then bake as above, sprinkling on the mozzarella at the end of baking time. Note: a serving is 3 – 4 shells per person. Serve with a side salad and garlic bread if desired. So good—with just a salad. “Two all beef patties, lettuce, cheese,…….. on a sesame seed bun”. Sound familiar? 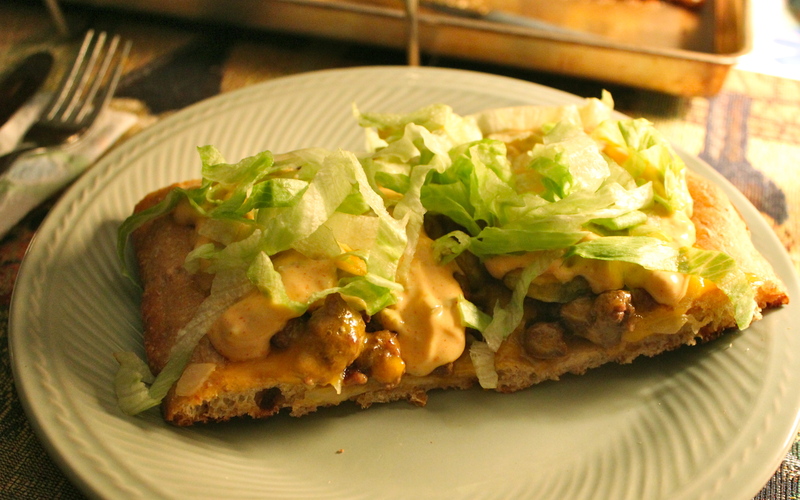 Today, I’m going to show you a fun way to recreate this fast food burger without a trip to the drive-in. I was somewhat doubtful that the sauce would come close to tasting like the one on the well-known burger, so I made up a half-recipe just to try it. My gosh, it is spot on! This is a great sauce to have made up ready to top off your burgers even if you don’t use all the other toppings. 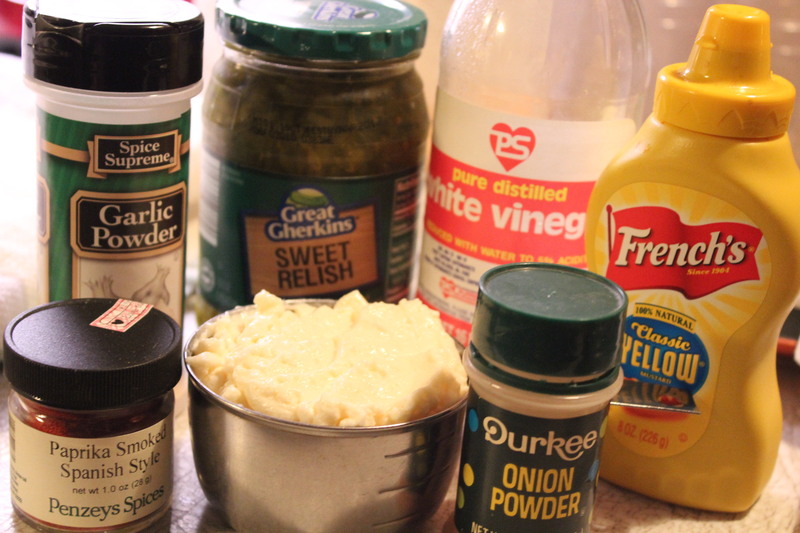 You could surprise your friends/family this summer with a cookout, serving this “secret” sauce on the burgers. With that piece of the recipe having proven itself, I was ready to make the whole thing. Included here is a good recipe for the dough, but if you don’t want to make you own dough or don’t have the time, a one pound package of pizza dough purchased at the supermarket will do just fine, and it’s a great time saver. 1. Combine all the above ingredients (except sesame seeds) and mix and knead to make a smooth, soft dough, using a stand mixer, bread machine, or your hands. 2. Place dough in a lightly greased bowl ( or leave it in the bread machine to rise) and let it rise until it’s very puffy, about 1 1/2 – 2 hours. 4. Deflate the risen dough, and stretch it into and oval with your hands. Plop the oval onto the baking sheet, and then press it towards the edges. When it starts to fight back, walk away for 10-15 minutes. When you come back, you should be able to continue pressing it to the edges, nearly to the corners. If you can’t, give it another rest and try again. The dough should cover as much of the pan as possible—without making yourself crazy over it. 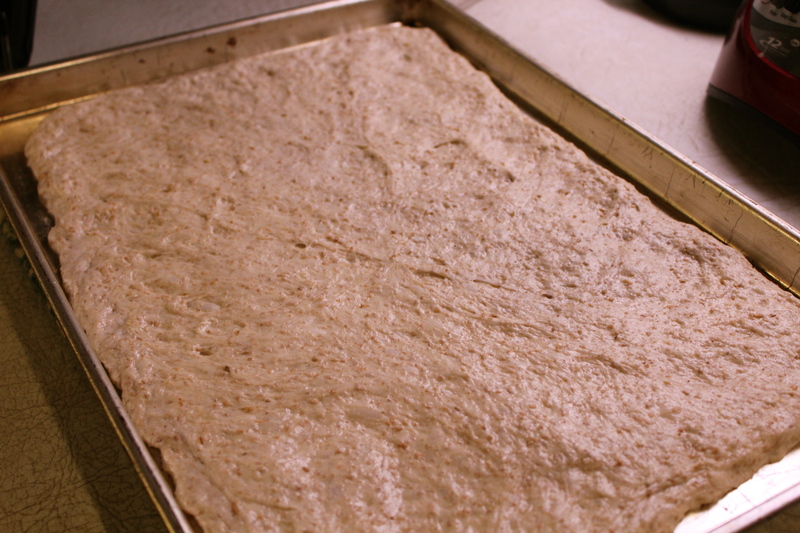 Spread dough in the baking pan. 5. Cover the dough, and let it rise until puffy, about 90 minutes. While the dough is rising, prepare the toppings. 6. 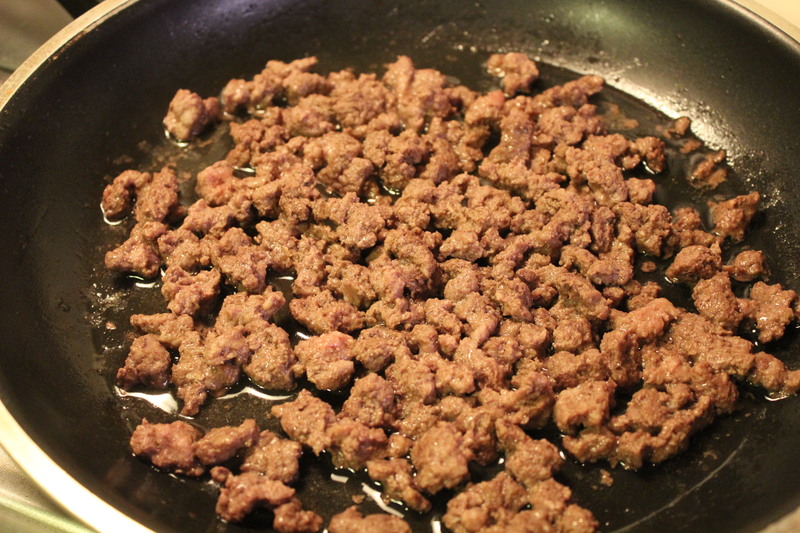 Season the ground beef with 3/4 teaspoon salt, and fry until brown; drain off the fat. Dice the onions, and shred the lettuce. If using whole dill pickles, slice 1-2 large pickles. 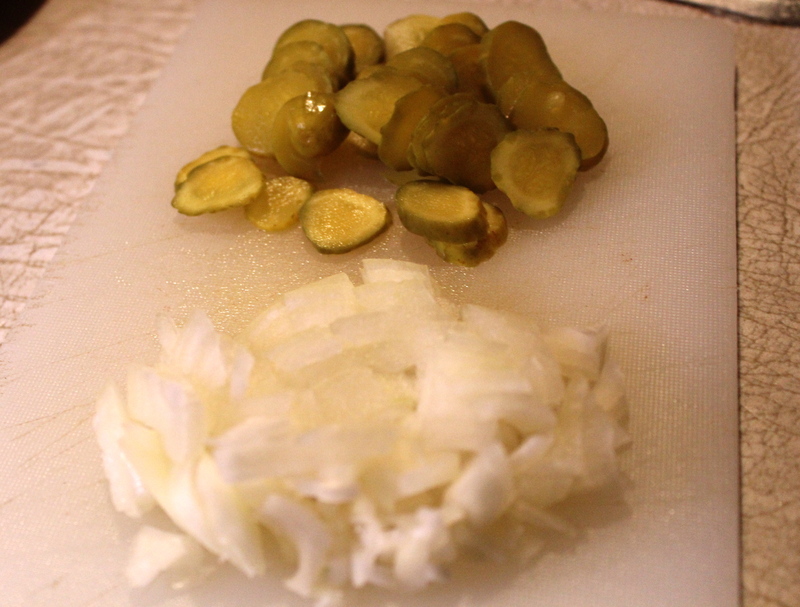 Chop the onions and slice the dill pickles. 7. Combine all the ingredients, mixing until smooth. Refrigerate until you’re ready to use. 8. Towards the end of the rising time, preheat the oven to 425 *F. Bake the crust for 10 minutes, or until very light brown. 9. 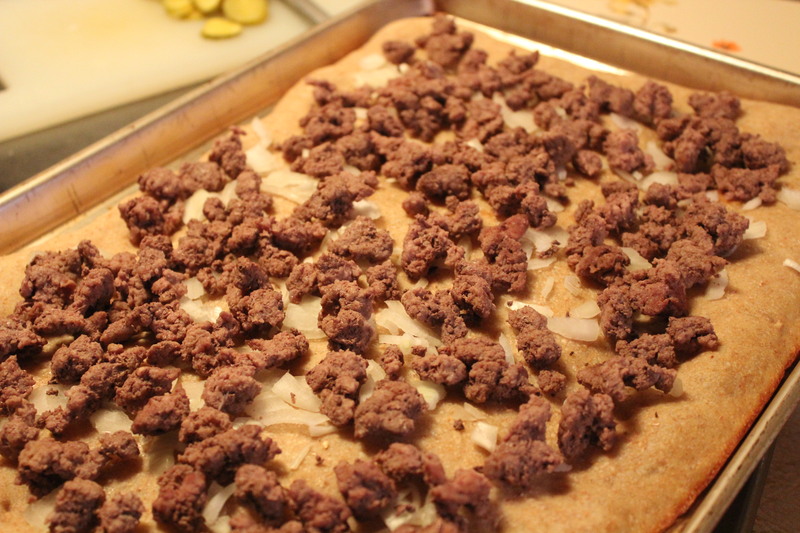 Remove crust from the oven, and top it with the diced onion, then the ground beef. Return pizza to the oven, and bake for 10 minutes. First layer: chopped onions and ground beef. 10. 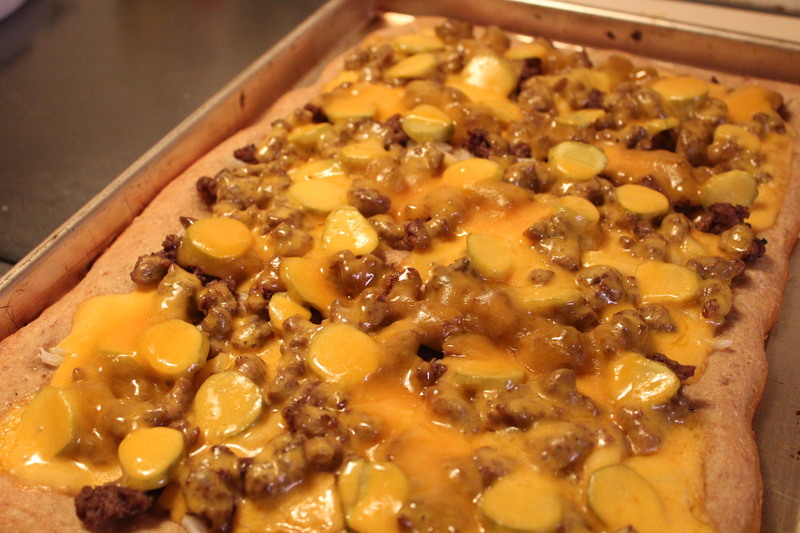 Remove from the oven, and top with the pickle slices, then the sliced cheese. Return to the oven, and bake for 10 minutes, or until the cheese is melted and the edges of the crust are brown. 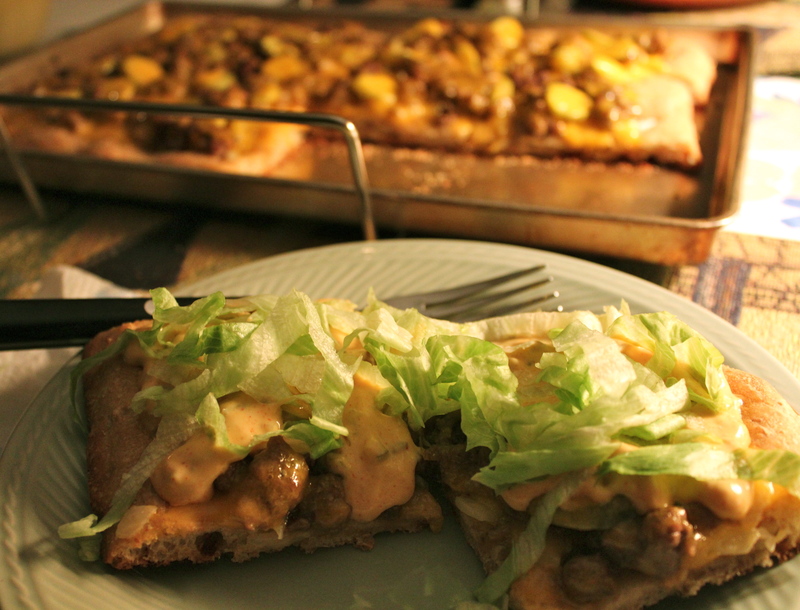 Second layer: sliced pickles and melted cheese. 11. Remove the pizza from the oven, and spread with the sauce. Finally, sprinkle with the shredded lettuce. Cut into 8 – 12 pieces and serve immediately. This size pizza was more than two of us could eat, so we spooned some sauce and then some lettuce on each piece as we ate it. This tasted just like the famous burger it mimics. The next day I wrapped the remaining piece in foil and heated it in a low oven, spooning sauce and topping it with lettuce as we had before. We loved it and I will definitely be making it again. It tastes just like the burger, without going to the drive-in. As I was looking through the November issue of Cooking Light Magazine, this recipe for Butternut Squash and Mushroom Tart caught my eye because the picture of it was so appetizing. I wanted to make and eat it right then and there, but I earmarked the page for a more opportune time. Well, the time came this past week. After the cooking and baking frenzy that was Christmas I was ready to prepare a simple meal, and enjoy the process of doing it. Boy, am I ever glad I finally got around to making this tart. From the crust on the bottom to the cheese on top, it is one layer after another of delicious flavors that compliment each other perfectly. Let me start with the crust: the ingredients are mixed in the food processor and once mixed, go straight into the pie plate where you form the crust with your fingers by pressing it against the bottom and sides of the pan. Then it goes right into the preheating oven to begin baking. The recipe as printed in the magazine relies on prepared ingredients, i.e. pre cubed squash, chopped onions, pre chopped pancetta, and pre sliced mushrooms as time savers. However as a cost saving measure I don’t usually purchase my vegetables this way, preferring to prep them myself, so that added some time to the preparation of this dish. The shiitake mushrooms I purchased were whole caps that I sliced, and the pancetta was in slices that I cut into small pieces. This all added about 15 minutes to the preparation time. Because I knew the prep work would take a little time, I did all of it before making the crust, so once the crust went into the oven I was ready to continue using the processor to make the filling. Cutting the squash into fine pieces cuts down on the cooking time, and changed the texture somewhat and when the onions get mixed with it the flavor and “mouth-feel” was very pleasant. Eggs, cheese and seasonings get mixed with the squash and onions, then poured into the partially baked crust and baked. While that is happening, you sauté the pancetta till brown and then add and sauté the mushrooms. The final step is to arrange the mushrooms and pancetta on the tart surface followed by the remaining cheese and bake until the cheese melts. Hot and melty from the oven. My final product was as pretty as the picture in the magazine. 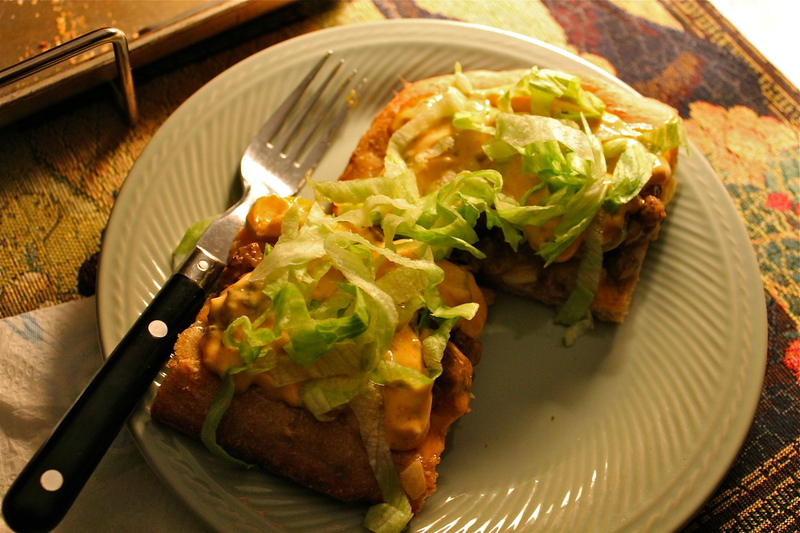 The crust was flaky and tender, it remained dry and flaky in spite of the wetness of the filling baked in it. This tart also cut perfectly; each wedge holding its shape as it was removed from the baking dish. I will definitely use this recipe and method for making a crust for tarts and quiches that I make from now on. I might also add that I felt that the time spent making this dish was well worth the effort, because the finished dish was so perfect in every way. 2/3 cup shredded cheese, divided. Gruyere, Gouda, Edam are all good choices. 1. Preheat oven to 425 degrees. Lightly spray a 9-inch pie plate with cooking spray. 2. To prepare crust, spoon all the flour plus the salt, pepper and baking powder into the work bowl of a food processor. Pulse 2 times to mix. Combine 1/4 cup oil with the 3 Tablespoons ice water in a measuring cup. With the processor running, slowly add oil mixture through food chute, and process until dough is crumbly. Pour dough into the pie plate. Pour crust crumbles into pie plate. Working quickly, press dough into an even layer in bottom and up sides of pie plate. Press crust into pan with your fingers. Place crust into preheating oven, and bake for 10 minutes. 3. To prepare the filling, place squash into food processor (do not clean from dough), and process for 1 minute or until squash is finely chopped. Heat a large non-stick skillet over medium-high heat. Add 1 Tablespoon oil to pan and swirl to coat. Add squash and onion to pan; sauté for 9 minutes, stirring occasionally. 4. While squash cooks, combine half the cheese ( 1/3 cup), eggs, 1/4 teaspoon salt and 1/4 teaspoon pepper in a small bowl. Stir into the squash and onion mixture. 5. At the end of 10 minute baking time, remove the crust from the oven, spoon squash mixture into the crust and spread evenly. Return to the oven and continue baking for 9 minutes. 6. Return skillet to medium-high heat. Add remaining 1 Tablespoon oil to pan; swirl to coat. Add pancetta; cook 1 minute or until beginning to brown. Add mushrooms and cook for 7 minutes or until browned. Browning the pancetta and mushrooms. Stir in remaining 1/4 teaspoon salt and 1/4 teaspoon pepper and 1/4 cup white wine. Cook 1 minute or until liquid almost evaporates. 7. Remove tart from oven. Arrange the mushroom mixture evenly over the top of the tart; sprinkle with the remaining 1/3 cup cheese. Return tart to 425 degrees oven and bake for 3 – 5 minutes until cheese melts. A fantastic dish on all levels! Serve this delicious entree with a mixed green salad for a complete, low calorie, almost meatless meal. To make it vegetarian just omit the pancetta. Calories 368, Fat 21.8 g., Carb 31.6 g.
Remember Swanson Chicken Pot Pies, or Beef Pot Pies? A quick one-dish meal. The idea was a good one but I’m not sure how good they were for you what with the saturated fats used in the crust, high sodium content, and the thickening used in the gravy. This recipe for chicken pot pie is not like that. This is a new and improved version of that classic dish. It makes use of leftover chicken (or turkey), a simple gravy, and lots of vegetables, baked in a casserole with a single top crust that can be a refrigerated pie dough, or a sheet of puff pastry. It is quite thick and very filling. It can be served with some cranberry sauce on the side and a mixed green salad for a complete meal that is conservative on calories (around 400 / serving), and low in carbohydrates, fat and sodium. Not bad for such delicious comfort food! 1. Peel and cut up carrots. Bring to a boil and simmer over medium heat until crisp tender. Drain. 2. Preheat oven to 400 degrees. Have ready a 2 quart souffle dish or deep casserole. Spray lightly with non-stick spray. 3. Melt butter in a 3-quart saucepan over low heat. Add flour and stir until smooth and frothy. Let mixture bubble about 3 minutes and stir often to prevent from browning. Gradually stir in broth and increase heat to medium. Simmer stirring constantly, until mixture thickens. Stir in poultry seasoning, pepper sauce, salt and pepper. 4. Add cup up chicken, carrots, onions, mushrooms, and peas. Cook, stirring occasionally, 5 minutes until heated through. Transfer to prepared dish. Add chicken and vegetables to the gravy. 5. Roll out the pie dough or puff pastry to a size big enough to cover the top of casserole, with a slight overhang. Cut vents in the dough. Use some of the egg glaze to brush the top edge of the casserole. Lay the dough on top of the casserole, pressing onto the egg wash. Flute the edges as desired. Brush the pastry all over with the egg glaze. Lay on pastry top and brush with egg glaze. 6. Place casserole on a baking sheet and bake 25 – 30 minutes until pastry is golden. If using refrigerated pie dough, it may take 40 – 45 minutes baking time. Bake till crust is golden.